Anza-Borrego Desert is the largest state park in the Southwest, covering 600,000 acres of southeast California from the edge of the coastal mountains east to the Salton Sea and south almost to the US/Mexico border, and rivaling the more famous national parks further north for varied, unspoilt desert scenery. The elevation ranges from 6,200 feet to just 150 feet, and the land beyond the east edge descends to below sea level, hence the temperature can be appropriately extreme, with 120°F not uncommon - the average July maximum is 110°F - and a 30°F difference is possible between the often cloud covered western peaks and the parched deserts far below. Such is the heat in summer that the visitor center is open only at weekends, as far fewer people visit here than in the cooler seasons. The dispersed town of Borrego Springs lies at the center of the park, which is characterised by one large flat basin bordered on three sides by the mountain ranges. 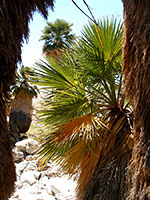 The slopes hide many canyons with palms, cacti and yucca near the basin changing through bushes to pine trees near the summits. Three main roads lead into the park (see map); S22 across the north, CA 78 across the middle and S2 running southeast-northwest, mostly close to the western edge. There are many unpaved tracks leading into the backcountry but the majority require 4WD. 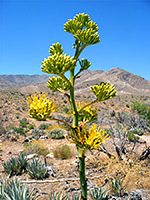 Hiking, backpacking and exploring are the main activities, and entry to Anza-Borrego Desert State Park is good value at $8 peak season or $6 off peak (2012 prices). Camping is allowed without further charge anywhere away from the main roads though there are several official sites with fees starting from $20 per night. 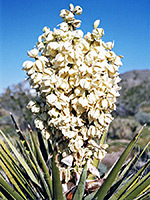 In spring, many people visit just to see the profusion of many different types of wildflowers that cover the park, beginning in the deserts during February to March and progressing up the canyons in early summer. 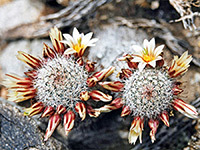 The high country of Anza-Borrego Desert State Park offers plenty of trails, some of which extend into the adjacent Cleveland and San Bernadino National Forest lands to the west and north, and these areas are especially popular in summer when the heat in the lower areas can be too intense. 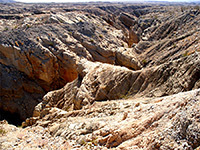 Away from the hills, most of the park is desert - covered by densely growing cacti in some areas but with bare rock and eroded badlands in others, through which run numerous narrow, slot-like canyons and other interesting rocky features.